We’d love your help. 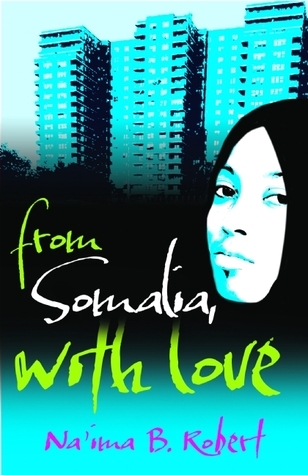 Let us know what’s wrong with this preview of From Somalia with Love by Na'ima B. Robert. To ask other readers questions about From Somalia with Love, please sign up. I think everyone can relate to Safia in this story. She deals with friend and family struggles, she starts to somewhat question her Muslim practices, and she lives the life of a normal teen. After reading this, I have a new respect for Islam religion and Somali culture. They almost seemed to intertwine and it was hard to differentiate, but reading about Safia's life and hardships helped to relate to her and other Muslims. Their prayer rituals really intrigued me, and I like hearing about her vie I think everyone can relate to Safia in this story. She deals with friend and family struggles, she starts to somewhat question her Muslim practices, and she lives the life of a normal teen. After reading this, I have a new respect for Islam religion and Somali culture. They almost seemed to intertwine and it was hard to differentiate, but reading about Safia's life and hardships helped to relate to her and other Muslims. Their prayer rituals really intrigued me, and I like hearing about her viewpoint on hijabs. But it was her devotion to Allah that I really loved. It was a completely different perspective, especially when she is at a movie theater with a boy and feels so bad, she walks out. That is such an astounding dedication to me, and it is truly inspiring. I thought this book had a great (although somewhat questionable for children) climax and shared some great lessons. My favorite part is when she says, "And I thought about Firdous: the escape she had offered, how she had seemed to have everything, how I had yearned for just a taste of what she had-and how bitter it had turned out to be." We all sometimes desire lifestyles and belongings of others, but when you experience what they have, it's never as great as you thought it would be. To me, this is a great lesson to be thankful for what you have. From Somalia, With Love is a really gentle and lovely story of a girl who's trying to find her place in the world. Safia left Somalia when she was very young and remembers little about it. Home is in Awhile back, I read a few reviews of From Somalia, With Love and thought 'that sounds like a book I'd like to read' and promptly forgot about it. So I was absolutely thrilled earlier this year when Frances Lincoln offered to send me copies of both this and Na'ima B. Robert's latest book Boy vs Girl. the premise is so great: safia escaped war torn somalia with her mother and two older brothers before she was old enough to have memories. her father was thought dead. safia is 14 when her family learns that abo is alive and coming to join them in east london. unfortunately, the characters are one-dimensional stereotypes and the writing is dreadful. the characters are punished bitterly by life every time they disobey their parents or push the rules; muslims are taunted on the street for wearing h the premise is so great: safia escaped war torn somalia with her mother and two older brothers before she was old enough to have memories. her father was thought dead. safia is 14 when her family learns that abo is alive and coming to join them in east london. Safia Darie is a 14 years old Londener. She is also an immigrant and a Somali Muslim. For 12 years, she has been living in a council estate with her mom and two brothers. Then the family receives word that Safia's father is alive and is about to reunite with them in England. This news sends Safia into a tailspin. She worries how her father will react to the Westernized society his children are living in, how he will react to her wild brother Ahmed, and more importantly, how he will react to her. Safia Darie is a 14 years old Londener. She is also an immigrant and a Somali Muslim. For 12 years, she has been living in a council estate with her mom and two brothers. Then the family receives word that Safia's father is alive and is about to reunite with them in England. This news sends Safia into a tailspin. She worries how her father will react to the Westernized society his children are living in, how he will react to her wild brother Ahmed, and more importantly, how he will react to her. Her worst fears seem to become realized upon her father's arrival. Her mother has no time for her, her father expects her to wait on him hand and foot and Safia finds herself attracted to her cousin Firdous' westernized lifestyle. Safia Dirie is a Somali girl who barely remembers Somalia. She's lived in London most of her life, with a strong family and religious community. But the return of her father, who has been separated from the family since their escape from Somalia 12 years ago, throws much of Safia's comfortable life into confusion. Her mother embraces the subservient role of wife, her brother rebels against her father's authority, and perhaps worst of all, her father seems to crave no relationship with Safia beyo Safia Dirie is a Somali girl who barely remembers Somalia. She's lived in London most of her life, with a strong family and religious community. But the return of her father, who has been separated from the family since their escape from Somalia 12 years ago, throws much of Safia's comfortable life into confusion. Her mother embraces the subservient role of wife, her brother rebels against her father's authority, and perhaps worst of all, her father seems to crave no relationship with Safia beyond her bringing him tea. When she has a fight with her best friend and falls in with her "wild" cousin, Safia's adherence to tradition and faith are tested. From Somalia with Love is a very well-written coming of age story that centers around a teenage Somalian girl named Safia who lives with her mother and siblings in London, who's world is thrown upside-down when her assumed-to-be-dead father arrives after a 12-year absence. This book takes a very common "girl growing up and finding out who she really is" story, but since it is coming from the seldom seen perspective of a Somali Muslim refugee, it gives the book some very nice added depth. I would From Somalia with Love is a very well-written coming of age story that centers around a teenage Somalian girl named Safia who lives with her mother and siblings in London, who's world is thrown upside-down when her assumed-to-be-dead father arrives after a 12-year absence. This book takes a very common "girl growing up and finding out who she really is" story, but since it is coming from the seldom seen perspective of a Somali Muslim refugee, it gives the book some very nice added depth. An interesting peek into the daily life of a Somali Muslim teenager. Safia has been raised in England, and lives with her mother and two older brothers. Out of the blue, she finds out that her father, who has been in Somalia, is finally coming to rejoin the family. With the arrival of her father, the family dynamics are suddenly upside down. While Safia wants to support her mother's happiness, she feels left out and unsure of her place, especially after her favorite brother clashes with her fath An interesting peek into the daily life of a Somali Muslim teenager. With the arrival of her father, the family dynamics are suddenly upside down. While Safia wants to support her mother's happiness, she feels left out and unsure of her place, especially after her favorite brother clashes with her father and runs away from home. A girl I know from homework volunteering liked this book, so I thought I'd check it out. Safia's conflict between Somali culture and modern London culture was worth exploring, but resolved in an easy and pat way. I felt like the author was limited to 150 pages and set everything up to resolve in the quickest way possible. Maybe a series of books about a girl like Safia would work better, but I'm not sure that publishers are clamoring for books about Somalia girls (although I know a few Somali gi A girl I know from homework volunteering liked this book, so I thought I'd check it out. Safia's conflict between Somali culture and modern London culture was worth exploring, but resolved in an easy and pat way. I felt like the author was limited to 150 pages and set everything up to resolve in the quickest way possible. Maybe a series of books about a girl like Safia would work better, but I'm not sure that publishers are clamoring for books about Somalia girls (although I know a few Somali girls who are). This is a book about a girl discovering herself. She is going through so many different things as a teenage muslim girl. In this book she is trying to find the way of life that works best for her. She wants to have the best life possible even with all of the challenges she faces. This is a good book for someone to read who is going through life choices or someone who would like to see a little more into the muslim life style. I was curious about how Muslim girls in Britain are growing up ever since those three British Muslim school girls ran away to join ISIS. This book though is about growing up without a father and then adjusting to him when he gets back. It's more a tale about how not to fall off the straight and narrow path as a good Muslim girl. I am glad that such books are being written even though I am not the intended audience. 14-year-old Samia is a British Somalian Muslim teenager, trying to come to terms with her identity and how life will change when her father returns home, a father she has not seen in 10 years and was presumed dead for a long time. What I loved about the book was the honest perspective and the interweaving of Somalian Muslim phrases and the challenges and rewards of being Somalian and Muslim. However, at the same time, the writing at times felt a bit forced. This book had a great story, and was very interesting. I would not require it for students under the age of 7th grade, just because there are some things in there that could put ideas into children's minds. I would for sure have this in my classroom if I was teaching older grades, but not so much k-6. in England. I had to read it for a class for my Masters in Education. Not genuine at all and somewhat insincere. A great insight into a culture I needed to learn more about! This book is a true insight into the experiences many of our centra MN Somali students are living on a daily basis. It's a small book--quick to read! This was an easy read which I went through in just 2 days. The story was really catchy as the main character was believable & likable, and it was interesting as I know little about the Somali culture & the Islam religion. Insightful, this little book takes the reader inside the world of a Somalian teenager growing up in London. It has some depth in terms of cultural tidbits that I learned from, but mostly it is a puff piece aimed for a young audience. I think many teens will like it. I did. Easy and interesting. Genuinely couldn't put this down. Beautifully written with inspiring characters for today's youth! Full review coming soon on my blog. Great book for tweens or early teen girls. Introduces diversity and family dynamics that many girls face regardless of ethnic background. Amazing book... Packed with the values that today's muslim woman requires in the ever changing world we live in!! Na’ima B Robert is descended from Scottish Highlanders on her father's side and the Zulu people on her mother's side. She was born in Leeds, grew up in Zimbabwe and went to university in London. At high school, her loves included performing arts, public speaking and writing stories that shocked her teachers. Her popular 'From my sisters' lips' explored the reality of living as a Muslim woman in th Na’ima B Robert is descended from Scottish Highlanders on her father's side and the Zulu people on her mother's side. She was born in Leeds, grew up in Zimbabwe and went to university in London. At high school, her loves included performing arts, public speaking and writing stories that shocked her teachers.